Sacagawea (Sakakawea, Sacajawea, Sacajewea; see below) (c. 1787 – December 20, 1812) was a Native American woman who accompanied the Corps of Discovery with Meriwether Lewis and William Clark. Most of what is known of her life is from incomplete records and is therefore imbued with a great deal of legend and hearsay. She was born to a tribe of Shoshone near what is now Three Forks, Montana, and betrothed at an early age to a much older man. However, in 1800, she was kidnapped by a group of Hidatsa, and taken to their village near the present Washburn, North Dakota. She therefore grew up culturally affiliated with this tribe; her name is taken from the Hidatsa phrase for "Bird Woman." She was named so because when she was born a flock of white birds flew overhead. At the age of about sixteen she married a French trapper, Toussaint Charbonneau, who was also concurrently married to another Shoshone woman (he had purchased both from the Hidatsa as slaves). Sacagawea was pregnant with their first child when the Corps of Discovery arrived in the area to spend the winter of 1804/5. Needing someone to interpret the Hidatsa language, Lewis and Clark interviewed Charbonneau for the job. Although they were not overly impressed with him, the deal was sealed when they discovered that Sacagawea spoke Shoshone, an added bonus. She would become invaluable in her role as interpreter, as seen below. Sacagawea gave birth to a son, Jean Baptiste Charbonneau, on February 11, 1805 while staying with the party at Fort Mandan. She would carry the infant throughout the entire trip to the Pacific Ocean and back. This had a very salubrious effect for the party—native tribes spotting the expedition knew that war parties didn't generally travel with a mother and child, and would therefore approach in a friendly manner. Undoubtedly this dispelled quite a bit of friction with the people they met throughout the excursion. Contrary to a common romantic view, Sacagawea did not act as a "guide" per se on the main part of the trip; her knowledge of the land was limited to the areas in which she grew up. Once the party was past her former Shoshone settlement, her knowledge of the land was no greater than that of the rest of the group. She did however perform well as a "pilot" in the North Dakota/Montana area; for example, she was able to help the group get a bearing on the return trip by pointing out Bozeman Pass. Her main duties were as a translator, and this worked in a very circuitous way. For example, with the Shoshone, she would translate into Hidatsa to her husband Charbonneau, who would then translate into French (he knew little English, but several others in the party knew French). The value of having Sacagawea as a Shoshone translator was proved when they reached her old village, and she was reunited with her brother, Cameahwait, who had by that time become a tribal leader. This smoothed the way in the negotiation to obtain much-needed horses from the Shoshone. As recorded in the expedition's journals for May 14, 1805, Sacagawea proved crucial to the success of the project when her husband Charbonneau capsized a pirogue the group was using to make its way upriver. Unable to swim, Charbonneau flew into a panic and was unable to help right the situation; Sacagawea therefore calmly went about collecting items which had been lost into the river: instruments, trade items and—perhaps most important, at least to future generations—the water-sodden pages of the journals themselves. After their return to Fort Mandan, the members of the expedition parted ways with Sacagawea in August of 1805. They extended an offer to take the Charbonneau family to St. Louis, offering to provide land for the family to farm and an education for Jean Baptiste. This offer was declined at the time, but by 1809 the family had moved to St. Louis. Toussaint Charbonneau abandoned farming after a few months, going with Sacagawea to Fort Manuel (near today's North Dakota/South Dakota border) and leaving Jean Baptiste in the care of William Clark. Records of Fort Manuel show that Charbonneau then left Sacagawea there while he was off on further travels, and that she died in December 1812 of "putrid fever" (which was at the time a description for what is now called diphtheria). She would have been approximately 25 years old at the time. It is important to note that these records are disputed by many Native Americans, and there also is wide belief among the Shoshone people and historians that Sacagawea died from old age on April 9, 1884 at nearly 100 years old. For these reasons, she has 2 gravesites. As previously noted, reliable historical information about Sacagawea is extremely limited. For example, there was no contemporary portrait made of her. Regrettably, the lack of records has fostered a number of myths about Sacagawea. One of these is that she was romantically involved with Lewis or Clark; while the journals show that she was friendly with Clark and would often do favors for him, the idea of a liaison is almost certainly manufactured wholly by novelists who wrote about the expedition decades and centuries later. Another legend surrounding Sacagawea involves a Shoshone woman who claimed to be her, and who died at the Wind River Band reservation in Wyoming on April 9, 1884. The Wyoming DAR in 1963 went so far as to erect a Sacagawea monument near Lander on the basis of this claim. There is, however, no proof of it being true, and it is not accepted by most serious historians. Sacagawea is the most widely used spelling of her name, and is properly pronounced . Up until the latter part of the 20th century, however, schools mostly taught her name as being Sacajawea or Sacajewea. The confusion here almost certainly originated from the use of the "j" spelling by Nicholas Biddle, who annotated the expedition's journals in 1814. The error was compounded with the publication of the novel, The Conquest, written by Eva Emery Dye in 1902, in anticipation of the expedition's centennial. It is likely Dye used Biddle's secondary source for the spelling, and her highly popular book made it ubiquitous throughout the United States (previously most non-scholars had never even heard of Sacagawea). Conversely, the journals themselves mention Sacagawea by name seventeen times, each time with the "g" spelling. While the spelling Sacajawea has subsided from general use, the corresponding pronunciation persists in American culture. Sakakawea is the next most widely adopted spelling and pronunciation, and is the official spelling of her name according to the Three Affiliated Tribes, which include the Hidatsa. This spelling is widely used throughout North Dakota, notably in the naming of Lake Sakakawea. However, some historians and linguists discount this version, alleging its development was based on faulty research that went into an 1877 US Government Printing Office Publication, Ethnography and Philology of the Hidatsa Indians, which transliterated "bird" as "tsa-ka-ka," and "woman" as "mia," "wia" or "bia." Some advocates of this version prefer it because it approximates the generally accepted pronunciation but avoids the g/j confusion. Inscription on statueIn 1910 a statue was made and erected in front of the Capitol Building in Bismarck, ND with the following inscription: "Sakakawea - The Shoshone indian 'bird woman', who in 1805 guided the Lewis and Clark expedition from the Missouri River to the Yellowstone. Erected by the Federated Clubwomen and schoolchildren of North Dakota. 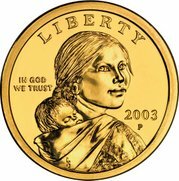 Presented to the State October 1910"
Sacagawea was portrayed on a US postage stamp in 1994, and she and her son Jean Baptiste are depicted on the currently-circulating United States dollar coin (image above). Sakakawea's statue (under that spelling) was added to the National Statuary Hall in the U.S. Capitol by the state of North Dakota in 2003. The Sacagawea Interpretive Center was opened in Salmon, Idaho in August 2003, near her birthplace in the Lemhi Valley.